The River Toadz Rain Jacket from Frogg Toggs is the perfect addition to every man's daily weather prep, as it's as effective at blocking the weather as it is fashionable. It's ultra lightweight and self-packable in its own built-in storage and pack pocket. The River Toadz Rain Jacket from Frogg Toggs is the perfect addition to every man&apos;s daily weather prep, as it&apos;s as effective at blocking the weather as it is fashionable. It&apos;s ultra lightweight and self-packable in its own built-in storage and pack pocket. Waterproof technology on which frogg toggs® was founded. This unique technology is constructed with a patented process of three layers of a nonwoven polypropylene material with a center layer of micro-porous film. Because the pores are 20 000 times smaller than a water droplet moisture cannot penetrate yet it breathes extremely well. Truly the best lightweight rainwear available and since it is composed of polypropylene the suits can actually be recycled. I've spent two years trying to find a lightweight, waterproof jacket I can easily pack in my golf bag. I figured at this price -- which for the features is way lower than anything else I could find -- the jacket would potentially be a disappointment. I am giving an overall rating of 4 simply because the quality isn't at the high end of my personal scale, but again, when you consider it's lightweight and the price paid, quality here is fine. I have literally poured water over the the sleeves of this jacket and my arms have remained dry. It folds down small so it doesn't take up much room in my golf bag. But, the problem is -- with the zippered side pockets and the velcro accessories pocket to one side of the main zipper, and its great looks -- I'm not sure I can talk myself into stowing this in my golf bag for that use only. It is probably a nicer looking casual rain jacket than anything I currently have on hand to kick around in. Might have to buy another one. I've searched for two years to find a relatively inexpensive but effective waterproof golf jacket, and this is it. 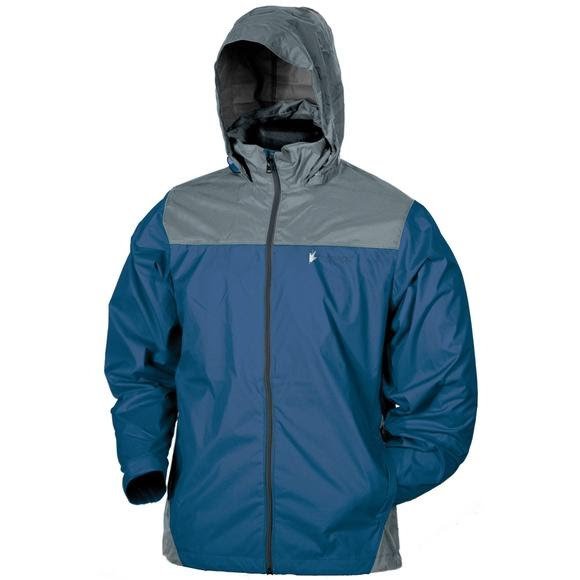 I normally wear size large shirts and jackets, so that's what I ordered in the Frogg Togg River Toadz jacket. I am pleasantly surprised at the fit, because it looks nice on me yet seems to have ample arm length and looseness in the shoulder area so there is no swing restraint -- even with a couple of layers worn beneath it. And to me, it looks terrific for such a low price. One more plus -- it folds down to easily pack in my golf bag without taking up a lot of space or making the bag bulky in the back of a power cart. Worn enough in rain, sleet, snow conditions to get dirty but it never let me get wet. Fit is terrific.